Moving time: 5 hr 5 min. Wind: Calm all day for a change. Weather: 55°F (13°C) in the morning; got up to 85°F (29°C) by end of ride at 3:30pm. Clear skies with a little haze. Today was a smooth, strong day of riding in the eastern Oregon mountains. Joe and I rolled out of Baker City about 8:00am and started our gradual ascent to Sumpter where the hill got really steep all of a sudden. 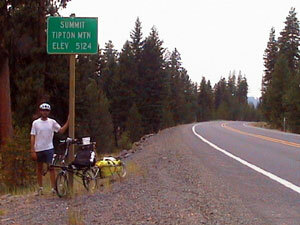 The route climbs to 5082 feet on Sumpter Pass where it makes an 800 foot descent into Whitney, Oregon. The road then makes a 900 foot climb to the top of Tipton Pass. Most passes here in the Rockies sport a sign at the top. There are only four more significant climbs left for the entire trip. I am a much stronger and more consistent hill climber than I was two months ago but still dread long, steep climbs. The descents are fun but climbing is very tiring. 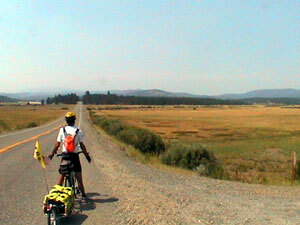 The last of the four climbs is McKenzie Pass just west of McKenzie Bridge. 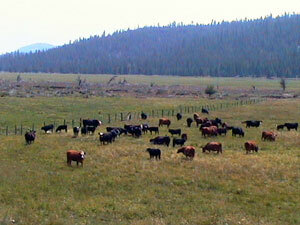 The pass lies at 5324 feet above sea level. 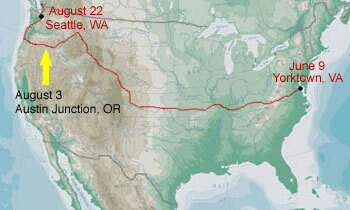 In just 135 miles I'll loose that entire elevation as I ride down the Cascades to the coast. My ride up the coast to Seattle and Vancouver, British Columbia will be hilly but not mountainous. 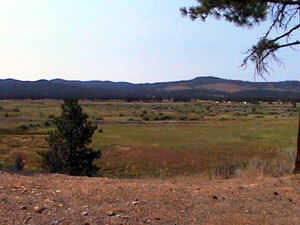 Huckleberry Mountain, home to Sumpter Pass, rises out of the Sumpter Valley. 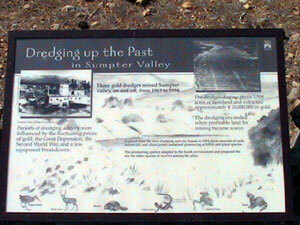 In the first half of last century the valley was flooded and dredged for gold with huge dredging rigs. Over $10 Million worth of gold was extracted in a 40 year period from just 2500 acres of land. Huge tailing piles fill the valley floor as a reminder of the successful mining in the area. 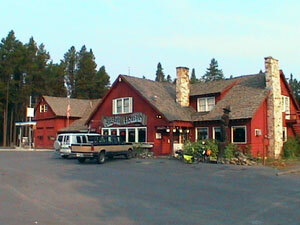 A short line, narrowgauge railroad operates as a tourist attraction in the valley today. It usually runs from Phillips Lake to Sumpter but has to stop three miles short of town today because of the high fire risk from the steam engine. Traffic was very light today with the exception of dozens of motorcyclists. This is a popular riding area for sport bike riders but not so much for touring motorcycles. The scenery is very nice and is much of what I expected for Oregon. It was far more hazy today than in the past few weeks. I suppose it is a combination of the smoke from Oregon wildfires and the heat and humidity of a warm summer day. We are camping out back of the store/gas station/bar/restaurant in Austin Junction. This isn't really a town but just the place where routes 7 and 26 meet in eastern Oregon. Tomorrow should be a great day of riding. There's a steep 1000 foot climb first thing in the morning followed by a 53 mile steady descent into Dayville where we plan to stay at a hostel.